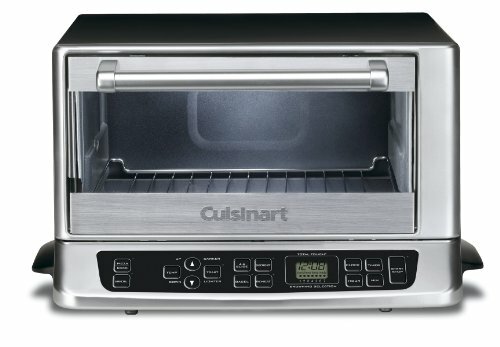 This Cuisinart TOB-155 Toaster Oven Broiler is another marvelous product that provides a number of convenient cooking features in one compact unit and I highly recommend it. With this multifunctional 1500 Watt powerful product you can now cook, bake, toast or broil as easy as pie. The sleek metallic exterior design makes it very eye catchy and there is no way one would not want it to be a part of their kitchen countertop. This is a three in one product with oven, broiler and toaster with a 0.6-cubic-feet capacity in one unit which saves you a great deal of buying separate products for all these things. Toast up to 6 slices of bread or bake a giant pizza or cake; now you get everything at one place with more convenience. Since it has 3 rack positions, you can make 3 pizzas at a time according to the manual. The shade control with heat sensor feature maintains the oven temperature very precisely and heats the food very evenly. The electronic heat sensor also properly keeps track of the temperature so that your food does not burn or over heat. Unlike most of the toaster ovens that comes with the manual setting knobs, Cuisinart’s TOB-155 comes with electronic touchpads which makes it even more user-friendly. This touchpad control panel also includes a digital LCD display for the clock and oven timer controls. It has an automatic shutoff feature that turns off the device if you leave it idle for four consecutive hours. Cuisinart TOB-155 complete package includes baking pan/drip tray, instruction manual and a recipe book. It also comes with a 3 year manufacturer warranty which indeed is a great offer. What Do Owners Say About The Cuisinart TOB-155? During the research I found that Cuisinart TOB-155 being the top quality product, gives owners the cooking experience they never had before. With its compact size, multifunction and sleek design, users get everything they need in one product. Exact Heat Control – Most owners love its smart shade control and heat sensor because it takes cooking and baking to a whole new level. They say that they never have to worry about burnt and overheated food. The shade control mechanism with its heat sensor regulates the heat inside the oven in such a way that it evenly heats up the food and maintains a very precise temperature inside the oven. Easy Cleanup – Most customers worry about the cleanup part of the oven, which in certain cases can be very disturbing and time consuming. But with the non-sticky interior and crumb catcher feature of this oven, it makes the cleanup process very easy and it does not even consume any time. Moreover, the crumb catcher is not made by teflon, which is loved by a small group of customers who worry about that Teflon might be harmful. The handle provided at the sides of the base lets you easily turn over this unit to empty its crumb tray. You can also take out the crumb tray for further cleaning if required but in most cases it won’t be necessary due to the non-stick interior. Versatile – Cuisinart TOB-155 not only has a large cooking capacity, it also gives you three different major cooking functionalities that include baking, toasting and broiling. It can toast up to 6 slices of bread, 12 inch pizza and with the exact heat technology you get the perfectly toasted bread in no time. Same as the toasting function, baking and broiling could not have been any quicker and easier. It lets you bake a family size pizza in no time. Apart from baking, toasting or broiling it is just as good for just heating or defrosting your food and leftovers as it does not dries up the food like most toaster ovens. Stainless Trim – Although Cuisinart TOB-155 is top of the line product and has numerous features that makes it unique, it also has certain issues that have been found customers complaining. One of the most highlighted issues that a lot of customers complain is the stainless trim around the oven. The stainless trim under the glass door ends up in the interior of the oven and it heats up when the oven is being used to cook. This leads to the heating up of trim on the outside of the oven under the door handle. The door handle itself does not heat up but the stainless trim can cause burns and injuries. You have to be very careful while using the oven, make sure not to touch the trim with bare hands. You can use an oven mitt or a hot pad to avoid any injuries and burns in case you accidentally touch the door. Cord – The built in cord that comes with the Toaster oven is somewhat short and it does not reach the electric socket if it’s a little too far. You would have to use a heavy cord extension because a normal cord extension heats up with the oven. This should not be a problem because most kitchens have a socket right behind the oven spot. Timer – The timer is very loud and non-adjustable; in some cases it proves to be very annoying. Sometimes the oven would not shut off with the timer and the clock keeps beeping unless you turn it down manually. There is no way you can practically lower down the volume of the timer. However this is just a minor flaw and does not bother so much if you are okay with the sound, besides, on the positive note you could hear the beep from a distance just in case if you leave your oven working. It may have certain small design problems but on the whole it is a perfect machine for a small family. It can also be used as an alternate to large ovens and it cooks just as good. With its metallic finish and elegant design, this is one of the top products one could buy. Because of its user friendly nature you do not even have to read a user manual and any one can figure out how to use it. Not only it has multiple extraordinary features, it also is a low budget unit which packs all these powerful functions in one product. Unless you want to spend some extra cash this would be the best choice that you would not regret for a normal everyday use.